The 1890's populist Detroit mayor, Hazen Pingree, has an excellent view of historic Central Methodist Church at the corner of Woodward Ave. and Grand Circus Park. 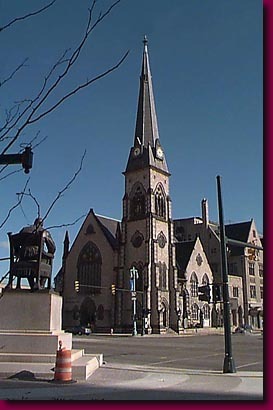 Rock of ages, Central Methodist Church, built in 1867, has seen it all on Grand Circus Park. The church, the Fyfe Building, the newly restored Detroit Opera House and the David Whitney Building are the only viable buildings remaining on the park. In 1936 the church's steeple and part of the nave were jacked up and moved back several feet to allow the widening of Woodward Avenue. A shortened nave resulted from the event.